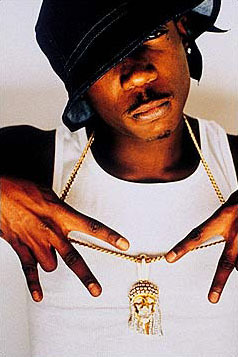 One of the more prominent hard-core rappers to emerge during the 1990s, Ja Rule (born Jeffrey Atkins) first took to the microphone at the age of 16. His recording career began with an appearance on Time to Build, a 1995 B-side from Mic Geronimo; the notoriety from this track soon led to his group The Cash Money Click landing a record deal with the TVT label, but only one single would result from the arrangement. Contributions to Jay-Z's popular single Can I Get A... and the soundtracks to films such as Streets is Watching, Belly and Rush Hour broadened his reputation, and with some help his friend Irv Gotti in Def Jam's A&R department a contract as a solo performer was buttoned up. His debut record Venni Vetti Vecci arrived in 1999 to enormous public response, aided in part by guest appearances from Jay-Z and DMX. The ubiquitous radio presence of the anthem Holla Holla insured the multi-platinum status of the record and established Ja Rule as one of the leading voices in the rap world. This would be built on the following year with his contribution to the charming five-MC collaborative project The Murderers, and the establishment of an acting career with his role in the film Turn It Up. A second album released towards the end of year, Rule 3:36, entered the charts directly at the number one position. The next two albums, Pain Is Love (2001) and The Last Temptation (2002) had no trouble repeating the platinum-earning selling power of the previous two, the former spawning the number one duet with Ashanti, Always on Time. Later that year, another duet -- Ain't It Funny with Jennifer Lopez -- took its place at the top of the charts. During these two years Ja Rule also continued to pursue acting, making appearances in testosterone-fare like The Fast and The Furious and Half Past Dead. Both sides to his career were furthered in 2003 with the release of Blood in My Eye and a role in Scary Movie 3.